Now that we have determined which currency system characteristics we desire, we will now discuss in detail how we might implement those characteristics to create the Currency Ecosystem which can give us the prosperity, stability, creativity, community, sustainability and gender balance that were enjoyed in the Age of Cathedrals and in Dynastic Egypt. We recognize that many viewers are not going to want to go into detail about how to implement the currency characteristics we just presented in Part V. We will therefor offer first, a summary of this section, and the text will then follow. This section itself is a much condensed version of the Implementation section of the GGCurrency Proposal document linked in the Resources page. Diagrams of the GGCurrency System, with comments, and of the Local Currency Systems, are available. You may find that the diagrams look confusing at first glance, but that correlating them to the attached notes clears up that confusion. 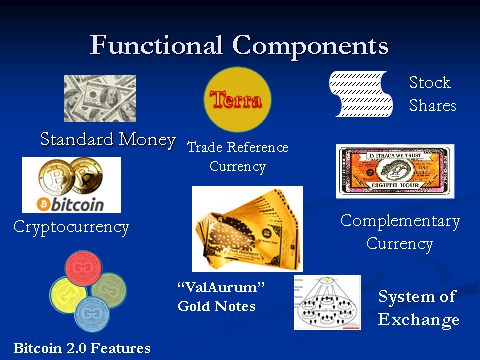 This money system has many different currencies to handle many aspects of the ideal currency system. Just like the US dollar has/has had more than 20 different currencies, GGCurrency will have different currencies for operating in different fields. Will be produced by cryptologic “mining”, which validates each transaction and creates a protected “blockchain” ledger of transactions. This is like the Bitcoin model. Other shares of cryptocurrency will be created as an arbitrary initial block of currencies, to form a digital version of GGT Shares. Ongoing creation of shares thru mining will be taxed in order to provide shares for those performing labor for the system. Ethereum is a new computer language created especially for creating cryptocurrencies such as GGCurrency. Ethereum adds many advanced features to the system, such as escrow, conditional transactions, property transfers, and much more. GGTrust Share Certificates will be used as a currency in the GGCurrency system. International Terra-like Trade Reference Currency provide countercyclical influence on world trade. A basket of physical assets and currencies will be used to back GGCurrency. This will give it value that fiat currencies do not have, and will prevent inappropriate creation of currency (inflation). It is suggested that the initial value of a share of GGCurrency be approximately 10 US Dollars. This would represent an hour of human labor, and also the price to purchase a 1/10th gram Aurum note. A fee to convert GGCurrency to national currency will tend to keep the currency in circulation, as will demurrage charges. A discount to convert national currency into local GGCurrency will also tend to bring value into the GGCurrency system. Share Exchange centers will be established at the local community, region and national levels. They will assist in marketing and administering the system, training businesses and members, and assisting in the transfer of one form of currency into another. Demurrage will be established on local currency to increase the velocity of its circulation.. It may also be applied to the Trade Reference Currency. 1. Creation of shares by mining. It was formerly necessary to use money “mining” to create new cryptocurrency, because mining is the work that insures the continued operation of the Bitcoin and most cryptocurrency systems. “Mining” is the performance of extremely complex mathematical operations as “work”, which work provides some value to the money that it generates, and makes it impossible to counterfeit. Money mining verifies the validity of each transaction, and that creates the blockchain, or continuous ledger of transactions which is the basis of bitcoin and most other cryptocurrencies. Without mining, most of these cryptocurrencies would have no system. A good explanation of this process is found in this video. More recently, cryptocurrencies have found other ways to create money and validate transactions, besides mining. One example is finding “consensus” among users. Even if mining is used to create some of our money, it is not necessary that ALL shares be created by mining. If there is already value in an existing local economy or business within an economy, that value may be recognized as being part of the system. Subsequently, mining can add other money to the system. In other words, if GGTrust was appraised at having a value of, say, one million dollars, then an equivalent value in GGShares could be recognized as already existing in GGTrust, and that value recognized in a new GGCurrency system. Mining would then add to the base value of the million shares. If GGCurrency functions as units of currency, and GGCurrency functions as shares of GGTrust, it does not follow that all of these shares need to be allocated to an individual, any more than that all dollars in existence or all shares of General Motors need to be assigned to an individual. In fact, in most cases of incorporation, all shares are not allocated, but a large number are retained by the treasury of that corporation. Actually, most GGT shares would be unallocated to individual beneficiaries. They would be in the treasury accounts, and beneficiaries would have a beneficial claim on them. Investors’ shares may be allocated for them, or unallocated. Think of it like a sinking fund, in the first case, which is held in reserve in case of future need. Iceland’s new cryptocurrency allocates 3000(?) shares to each person in Iceland. Thus, shares can be pre-mined and allocated to the beneficiaries, or arbitrarily created, followed by creation through mining. There must be a pool of unallocated shares available for those who create credit by doing work. Shares allocated by labor are discussed below. B. Colored Shares: All dollars are not the same! 1. “Colored Coins” is a concept in the extensions of the Bitcoin protocol described as “Bitcoin 2.0”. Colored coins remove the fungibility of electronic coins by allowing coins to be tagged with specific attributes not necessarily present on other coins. For example one type of Bitcoin might include the ownership of a gram of gold. Another might include the option to purchase a share of stock at a certain price. Another might include the ownership of a house, conditional upon another party transmitting 20,000 bitcoins into a certain account. The possibilities are literally endless. Bitcoin Is the most established and widespread cryptocurrency in use. While being widely used, it has limited capacity for expanding the types of value transmitted in its system. There are several methods suggested to “tack on” this capability, but none are as smooth as creating a new system built for this purpose. On the other hand, Bitcoin’s ubiquity and familiarity do give a level of trust to this first generation cryptocurrency system. Ethereum is a new cryptocurrency platform scheduled to be launched in the first quarter of 2015. Ethereum is specially designed to allow the implementation of any type of conditional contracts, instant autonomous transfer of any types of currencies or other agreements, values, assignment and registration of intellectual property, and much more. Ethereum is extremely flexible in its ability to allow us to create whatever system that we design. We will be able to design parameters such as the rate of creation of mined coins, to exchange different types of value, switch yang types with yin types of currencies, and enable escrow functions and conditional transactions, as discussed above. We would be able to tax mining of our coins to provide a source of coins for assigning to people performing labor, and to integrate GGT Shares with various other types of money. We will now explore some of the different types or characteristics to currency units as listed in Table 3. Similar to Federal Reserve Notes, Silver Certificates, Gold certificates, silver dollars, and digital amounts in a bank account, of which all are “dollars”, all GGCurrency units are fungible—have equal value and can be exchanged for each other, but they are not “equal” for certain uses. All dollars are “Legal Tender”, even if they don’t look the same, but historically only some could be exchanged for gold or silver. In the case of GGTrust, GGTrust decides which ones are acceptable for exchange for ownership shares of GGT, for Gold, Silver, or other assets. For example, artisanal local GGCoins may not be acceptable for exchange for silver, but may still be acceptable for local exchange for good and services. It may be possible for individual shareholders to decide other uses and characteristics of GGTrust shares, as the currency develops. Table 3. Examples of Possible Currency Names and Attributes. All of these currencies are interchangeable, like US Federal Reserve Notes, US Treasury Notes, US Gold Certificates, US Silver Certificates, Silver Dollars, and the “dollars” in your bank account. With the exception of LaborBux, all of the currency forms listed can be interchanged at will. Bill of Exchange An IOU on paper. May or may not involve the GGCurrency system. A note promising to pay the holder. GGBux (fanciful name) Yang-type international currency. Represents shares of GGTrust. Can exchange for share certificates, or exchange for assets backing the currency. Recognized as valuable anywhere in the system. May generate interest. Durable printed polymer notes.Larger denominations may have imbedded gold or silver threads, or incapsulated gold leaf or wafers. 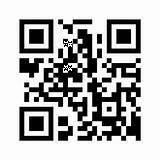 Have QR-code and hologram, security measures for protection and verification of value. LocalBux (Fanciful Name) Primarily used locally, though can be used anywhere in the system. Represent shares of GGTrust, and can be exchanged for other forms of GGCurrency. Quality paper or cloth imprinted with local images and names. Has hologram, QR-code and area for stamps. Artisanal Bux Primarily used locally, though could be collector’s items and can be used anywhere in the system, if recognized as genuine. Can be exchanged for any other type of GGcurrency. Printed or painted on high quality paper with affixed hologram, QR-code and area for demurrage stamps. LaborBux Usable for local trade, but cannot be traded directly for GGShares or assets. Printed paper with affixed hologram, QR-code and area for demurrage stamps. Beneficial Shares “Certificates of Beneficial Interest”, as authorized in GGTrust Bylaws. Have the same attributes as GGShares, but can only be assigned to Beneficiaries of the GGTrust Digital cryptocurrency or paper certificate with seals. Investment Shares “Certificates of Financial Interest”, as authorized in GGTrust Bylaws. Have the same attributes as GGShares, but are likely to pay dividends. Digital cryptocurrency or paper certificate with seals. 5. Some shares exist only as paper. But these paper shares can be exchanged for electronic shares in a 1:1 ratio. We consider that local currencies may have a standard back and a local face (like US quarters or Euros issued by different countries). High value share notes could have imbedded silver/gold to contain some intrinsic value. There is already a form of note containing gold. It is called the Aurum, and consists of pure gold sprayed between layers of polyester. Other considerations are to include threads of metal in poly or paper notes, wafers of gold in paper, and wafers or mini-ingots of gold in transparent windows. 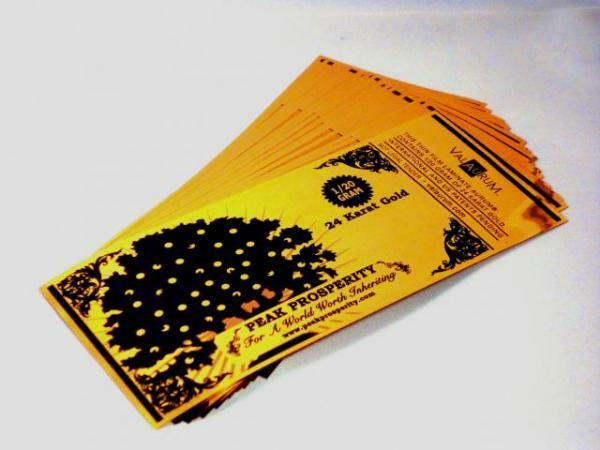 Aurum notes and some paper notes may be printed with QR-codes, which allow verification of status of a particular note, or could refer the recipient to a website to gain more information about the system. Some shares would have a durable physical representation. Consider minted coins and handmade artisanal coins of wood or metal. Fabric and paper art could be authorized for trade and imbued with share status. Some shares exist as electronically tradable shares. They could exist in an electronic wallet in a computer or smart phone, or on a share card, like a debit card. They could also be stored in an electronic wallet in an exchange center, accessible by visiting exchange center. This would be useful for someone less computer savvy who desired assistance with his account. In East Africa and now Holland and the UK, units of account exist in accounts in the telephone company, and can be easily transmitted to recipients with a simple SMS message on any mobile phone. Some digital shares are exchanged through account books of the local exchange center, which in one function behaves like a Mutual Credit Facility in assigning credit and debits earned by members as recorded in a central log for those who choose to participate. These credits are logged by the exchange center personnel and signed by the members. Can be exchanged for paper or electronic shares in a wallet or card. Local shares could even be exchanged with a handwritten note (check or bill of exchange), signed by an authorized member with an account on record. Some shares exist as treasury shares in the treasury of GGTrust. These shares are not assigned to anyone, but are in an account to be used in exchanges when needed. These shares could be previously mined shares, which are newly created shares added to the system. A tax on mined shares could generate shares to be given to laborers. So could the 2% fee generated by converting local currency to national currency. Suppose each mined block of 25 shares issued 20 shares to the miner, and 5 to the pool to be used to reward labor from new members, or impoverished members. In this case, if mining added one block each hour to the blockchain, as an example, then 5 new shares would be added to the treasury to be used for validating community labor. Each day, that would allow 120 hours of community labor shares to be added to the circulating money supply, without diluting the overall money supply any more than the regular expansion due to mining. Some shares are allocated to the Beneficiaries (through “Certificates of Beneficial Interest”). Some shares are allocated to investors (through “Certificates of Financial Interest”). Some shares are bearer shares (tradable notes could be bearer shares). Some shares are assigned to the owners, and are not tradable. These would act more like regular stock certificates. Some shares could be allocated to a counter-trade system like Terra TRC or Swiss Wir Francs. These shares could actually be created through trade only, as in these two systems, and would vanish when the shares were cashed in, exchanged, or redeemed. Shares are generally interchangeable, REGARDLESS OF “COLOR”. It is possible that there may be a premium of a few percent charged for exchange into Aurum or GGT Shares (GGBux in the chart above). This would discourage mass demand for these currency forms over others. Different names could be used to identify specific colors (types) of coin or shares. For example, GGCoin could be the electronic version, analogous to Bitcoin. GGCurrency or GGC could represent the whole alternative/complementary money system which GGT has created and operates. GGShares could be the shares convertible or exchangeable to actual shares of GGTrust, and perhaps for a share of the basket of commodities or the metals which back the shares. Local names such as VilcaShares, UKShares, SedonaShares, etc. could be local shares which were exchangeable within the GGCurrency System. Existing currency systems, such as Berkshares, could participate in the GGCurrency system as much or as little as they choose. Precious metals, such as Gold and Silver. GGTrust will own or control land with proven assets of 1.2 million ounces of gold (worth over 1.4 billion dollars) and 9 million ounces of silver, worth over 150 million dollars. And a total of $15 billion including inferred assets in as yet untested neighboring concessions we also control. GGCurrency is also backed by the collective labor of the people who work to create more GGCoins. GGCurrency shares are also valued because they include the value of shares of a billion dollar company. We propose using a value of about $10 USD for the initial value of a GGShare. This would be represented by a 1/10th gram of in the Aurum form, or about 1/3rd of a gram of pure gold. The aurum currently comes in 1/10th gram and 1/20th gram forms, costing about $10 and $5 USD to purchase. But the value of gold is severely suppressed by those who control the international monetary system. The downward pressure sustaining the price will be released at some point, leading to a significant rise in value. Dr. Jim Willie predicts a doubling of the price of gold, and quintupling of the suppressed price of silver. We expect that gold will take a large increase in value compared to the dollar in the near future, probably doubling. Silver will likely go up five times. What would we do with the value of the GGShare if that were to happen? Follow the gold price? Follow the silver price? Assume some ratio to tie them together, and follow that? We feel that a better idea would be to use a basket of commodities, currencies, and other assets such as real estate, forest reserves, and electrical power production might be a better and less volatile peg for the GGShare. We could certainly include human labor in the basket, but at what rate? The last consideration I listed above would be to use an industrial survey of the total value of GGTrust as an asset for the basket. This helped firm up the case in which labor is used to create credit. I then augmented it by further research into means of asset transfer and cryptocurrencies such as Ethereum, Ripple, Freicoin, Brixton Pound, and sidechains, was introduced to the concept of money as information, and included some further thoughts about local vs international complementary currencies. 1. First Principle: There are two major architectures that hold sway in the complementary currency world: Euro/Dollar based units and Mutual Credit based units. The benefit of national currency valued systems is that there is an immediate understanding of the value of the local currency. But because the value of the local currency scrip is the same as the national currency, the system is based on scarcity, since the national currency is scarce by definition. We almost always have less money than we do things to buy with the money. Mutual Credit based systems create money as credit [or debt]. Participants, businesses in particular, can just get a credit line in the unit and start spending. The minute they do, new money comes into existence. When a debtor repays his account, his payment cancels out his debt, so money is taken out of circulation. The great upside of this system is that there is no money scarcity: people will typically experience an abundance of money and a shortage of places where they could spend the units. The exact opposite of the Dollar/Euro situation, where most have less money than they would need to invest. There is interest-free credit [in the mutual credit system]. Businesses create mutual credit currency (MC) by being issued credit in exchange for their goods or services. Individuals can only create credit that others are willing to use. If you want to paint someone’s fence for MC units, he will only pay you MCs if he wants to create a debt to you, or if he has credits available which he wants to debit to pay you. In order for an individual to create labor credit MCs, an individual must do work for which someone else wants to pay. In other words, labor which is valued by another party, for which they are willing to debit their own credit account, or create a debt, in order to pay for it. This will help to decrease the amount of frivolous labor-created MC units created. For example, if someone decided autonomously to wash all the cars in the neighborhood, and then expected to be paid by the system for this labor which occurred without agreement or contract, there would be no obligation from the car owners, the neighborhood beautification committee, or the system, to pay her or issue mutual credits. But if the car owners agreed to pay her, or the community mutual credit facility agreed that they would authorize such a payment (preferably in advance), then she could be paid her MCs. Certain public entities can be authorized accounts of MC credits to pay for public works. These can be created de novo, or authorized from the Mutual Credit Facility (MCF) through a tax on mining, as explained above, or perhaps through the funds created when Mutual Credits are destroyed by being converted to national currency (see below). 2. Pay for Mutual Credit Currency at 95% National Currency rate. And redeem at a discount as well. MFC will serve as balance market for the currencies, and a mechanism for exchange of MC into National Currency. In our GGCurrency local currency design, the local exchange center functions as the MFC. It allows imbalances of value of the MC to be regulated by exchanging the two currencies, and it also allows the currencies to be transmitted to other recipients all over the world. The Arbuck coupon will be sold to our market customers giving them a 5% discount … and the vendors may convert them back into dollars … minus 7%. The extra 2% is subtracted as a contractually agreed transaction fee to pay the costs of coupon management. However, the vendors have the option of spending the coupons with their fellow vendors at full face value … and this is what keeps them circulating as a medium of exchange. I suggest that this is a very good model to follow: Just as money changers charge a buy/sell spread when changing Dollars to Euros or RenMinBi to Rubles, it makes sense to charge a fee for exchanging the Mutual Credit Currency/Local Currency (MC/LC) in either direction, into or out of national currency. But the purpose of this fee is not simply to make money for the currency exchanger, but also to stabilize the system. Giving a 5% discount on the sale of local currencies encourages participation in the Local Currency (LC) system. 5% is a reasonable cost of marketing, which manufacturers would have to pay anyway to find loyal customers. Charging 7% or so to convert the currency back into dollars/euros serves to incentivize the LC owner to spend the LC within the LC system, rather than convert out of the system. But if the number of LC units gets too high, then the relative value of them goes down, and destroying some MC/LC units by conversion into dollars/euros is a safety valve on the system. It provides a mechanism of balance to the whole system. Another way to provide that balance is to use a currency exchange system to send the value of the currency to another recipient. This would probably require the services of a money exchanger at some point, such as a gateway in Ripple, or a MCF or local exchanger in the local Mutual Currency system. The local Share Exchange Center (Local Exchange Centers) operates legally as a private club. It serves as a hub for exchange activities. It conducts training for new members and businesses. It keeps electronic wallets for members who choose, perhaps because they do not have ready access to a computer, and they load local debit cards with Shares. The Share Exchange Center exchanges between local share currency and electronic shares, and loads shares from bank accounts or paper notes into Magnetic Strip and/or smart cards. The Local Exchange Centers coordinate and recruit local merchants into the local system. They arrange for electronic Point of Service equipment (Card scanners, smartphone apps) if needed for local merchants. They authorize and approve the creation of local artisanal coins, and imbue the authorized coins with value by transferring mined shares into the object, and affixing hologram, QR-code or other authentication. It is important that holograms for one denomination not be able to be used for a higher denomination, and that the stickers be protected against removal and repasting. Having a separate type of hologram for each denomination of currency, with the denomination printed on the sticker, will help discourage transferring the stickers. Community level Share Exchange Centers authorize the creation of labor-based shares by members on a per-member basis. Labor performed must be for system members or for the community. This is how impoverished people are able to enter the trading system. This type of shares may or may not be exchangeable for GGshares, national currency, etc. Local Share Exchange Centers coordinate and authorize exchange of local shares for international shares or national currency, and collect the fee when they do it. They may authorize some merchants to do the same, but they must then collect the 2% fee from the merchants. Exchange centers coordinate with local Cooperativas, credit unions, shops or banks to sell, exchange or accept GGShares. Exchange centers exchange shares for Bitcoin, national currency, other local currencies. They exchange shares for Terra TRC-type currencies and coordinate business recruitment for this type of shares. They may have to be licensed or registered with local government as a money exchange office or cooperativas (credit union). They may provide microloans out of banked currencies from local members. Microloans may be in GGShares or national currency. The Exchange Center office could double as community meeting room, or could use space in a community center. Regional Exchange Centers, at the provincial or state level, provide training and support for the local centers. They provide local government interface and coordination, and coordinate large business or banking involvement. If necessary, they will coordinate exchange with local currencies not part of GGCurrency system. Using Ripple or a similar system probably will make this unnecessary. National Exchange Centers provide training and support for the local and regional centers, provide national government and bank interface and coordination, and provide legal support to local and regional offices. National centers access GGCurrency Central Centers directly. Demurrage is bound to be an issue of concern for the local currency system member. The purpose of demurrage, or “negative interest”, is to keep the currency circulating in the local community, to increase the prosperity of the community. As we saw above, using demurrage on a local currency can increase circulation rates, and thus effective wealth rates, by more than ten times. We therefore think that, in spite of its negative initial connotation, it is still wise to consider using demurrage. Demurrage on the local currency supports the local exchange center, and keeps currency circulating. The usual demurrage rate is about 12%, but half of that may be sufficient. If the rate is too high, it may encourage the user to convert the currency out of the system into national currency. For this discussion, we will propose that local currency has 1% per month demurrage, or 12% per year. This usage fee is taken out of electronic accounts on a monthly basis for “bank accounts” at the Exchange center. It is subtracted from smart wallets, smart phones at the time of transaction as a transaction fee. Each note or coin has an issue date or last stamp date. A “Paid up” note will be recognized as having a higher value than a note with fee due. If there is no evidence that the demurrage has been paid, the recipient will know that he will have to pay that fee, so that the value of the bill is lowered by a certain percentage, counting months back to the issue date or the date of the last stamp. The recipient may choose to charge the buyer the difference in national coins, for a small amount, or a higher amount of GGCurrency, for a larger amount. As we have discussed, there will also be a fee collected when local currency is exchanged into national currency. This fee typically is 3 to 10%, although we suggested 5-7% above. Lietaer suggest a 2% fee for conversion of his Terra currency into national currency. See Terra White Paper for a detailed explanation. Demurrage on the Terra is set at 3.5 – 4% annually, with a 2% fee to exchange into national currency. Dividends are commonly issued to holders of shares of a corporation as a payment for the use of their money. It will be difficult to issue dividends on all colors of GGShares. It will therefore be likely that only certain colors of shares will receive dividends. The first shares to receive dividends will be those attached to “Certificates of financial interest”, or investment shares. Registered shareholders will automatically be eligible for dividends. Holders of bearer shares may register with GGTrust investor services to receive dividends. Suitability for other colors of shares to receive dividends or interest must be determined. Trade Reference Currency (Terra) shares will not receive dividends. Beautiful International standard art for front of GGBux,Local artists design back of GGBux. Artisanal production of coins, local notes.